Spare Parts Puppet Theatre with the kind support of JM Wright Memorial Fund (held by the Fremantle Foundation) will be offering special Auslan interpreted performances for their theatre performances of The Farmer’s Daughter and The Night Zoo. Having an Auslan interpreter service offered at Spare Parts’ will provide equal access to arts and entertainment for people who are Deaf and their friends and families. An interpreter (specialised in signing for theatre) prepare by using a script and also attend a show, then perform live side-of-stage. Participants’ active engagement in the arts and cultural activities fosters social connectedness and promotes social inclusion. It also contributes to the community’s wellbeing by connecting people with others and in doing so, enhances quality of life of the participants, their families and the community at large. 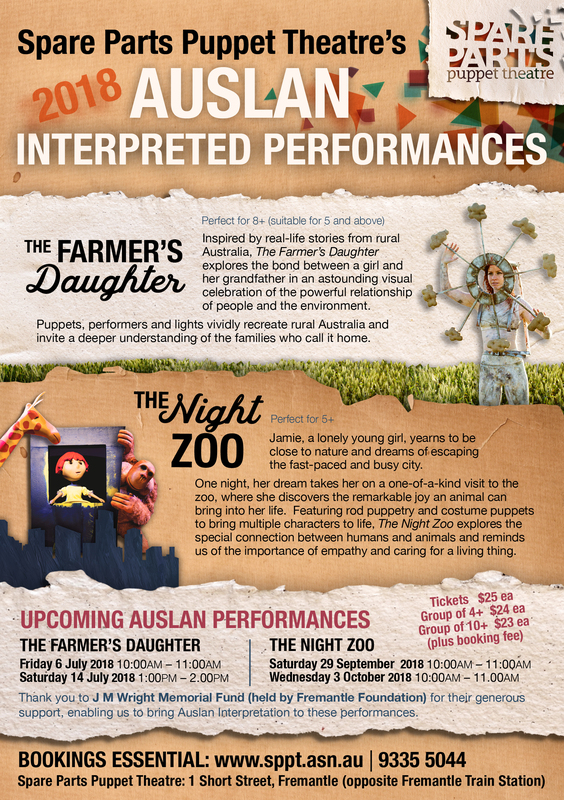 Tickets are available to the upcoming Auslan interpreted performances of The Night Zoo.